Hichem Yacoubi. Adel Bencherif. Tahar Rahim. Niels Arestrup. Antoine Basier. Giles Cohen. Jean Philippe Ricci. Reda Kateb. Gangster/Mob. Prison. 01 Ade tastics. 01 Nigel's Choice. Recommended. Drama. Drugs Related. Violence. Thriller. Malik is the anti-hero of this somewhat mystical mini-epic of a movie. 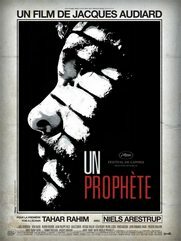 Just turned adult, illiterate, lacking a clear-cut ethnic identity, he finds himself doing 6 years in a prison run on the inside by a violent Corsican gang with the connivance of corrupt staff. With the guidance of the ghost of a now dead inmate Malik learns not just to read and write but to deal with the power politics of gangsterhood and it is his success at the latter that allows him to emerge from prison... There is a somewhat fairytale element to this immaculately made modern masterpiece.